More often than not, popularity is no sound reflection of quality or coolness. Think Bieber or the Kardashians (cue hate mail). The same can be said of cars. A case in point is the Corolla, one of the biggest selling rides in history and thoroughly deserving of its highly efficient, reliable though somewhat dull reputation. 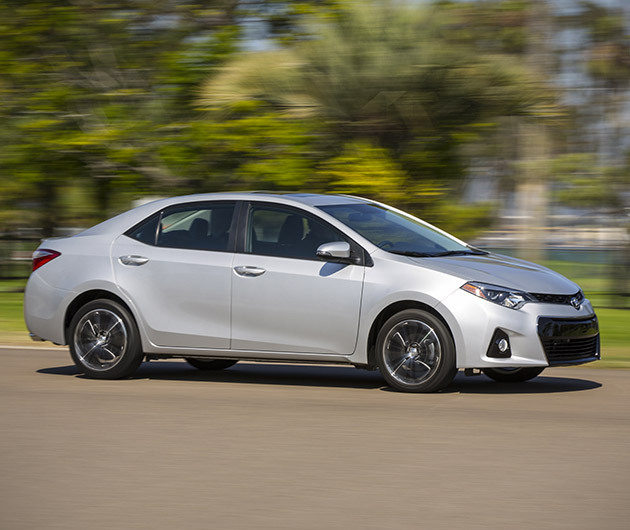 It was never destined to score a starring role alongside Optimus Prime and Co. but the 2014 Toyota Corolla looks to rectify that with a sporty new look both inside and out resulting in a quite staggering transformation. 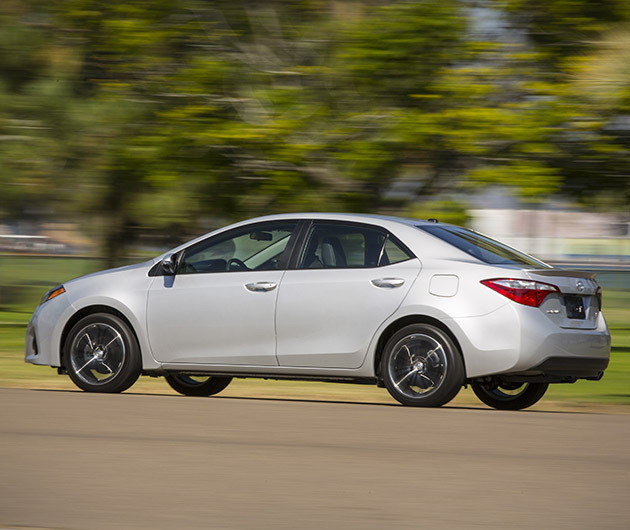 The eleventh generation of the compact sedan has gained 3.9 inches on its wheel base, lost a half inch in height and boasts a wider stance at its sculptured shoulders. Inspired by the Furia concept, its wheels are pushed out to each corner further enhancing its all-new athletic prowess. Four models are on offer: the L, LE, Eco and S and it’s the first of its kind to offer LED low beam headlamps as standard across the entire range. Other standards include central locking, electric windows, eight airbags, 60/40 split fold rear seating and color-keyed door handles and wing mirrors. 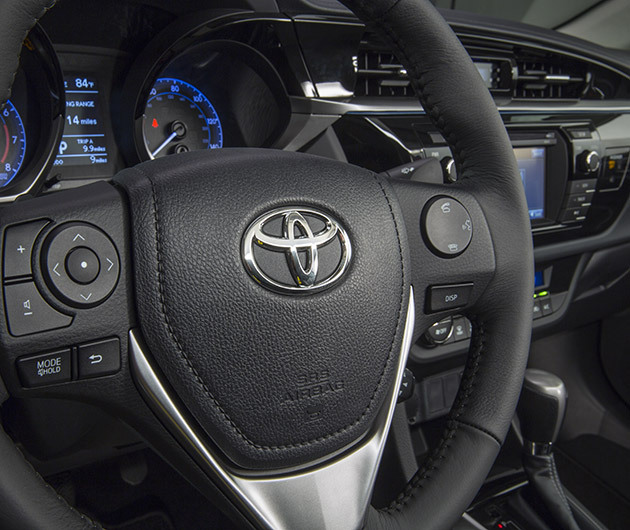 There’s a 1.8-liter 4-cylinder engine which generates 132 hp and it’s the first time that Toyota has offered Continuously Variable Transmission (CVT) to the U.S. market – available on all models above the base. Choose between a four-speed automatic or six-speed manual. The S-model comes with a seven-speed automatic or six-speed manual transmission with steering wheel mounted shift paddles. 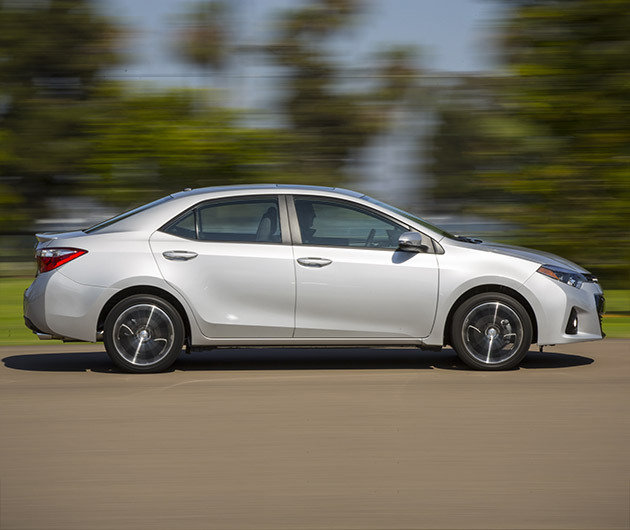 The Corolla has been forged from premium grade lightweight high-strength steel which – along with the all-new aerodynamic design – adds to the performance capabilities while improving efficiency. Steering and suspension has had an overhaul for a sportier feel. The Eco arrives with a spoiler as standard and an MPG increase of forty, helped by its low-rolling resistance tires. Its unique valve-train also boosts its horse-power by eight. The interior has been revolutionized, offering the ambience of a sports car, with loads more leg-room for both front and back passengers. The dash has been re-designed and standard goodies include Bluetooth connectivity and pollen filters. A range of color schemes such as amber or blue pinstripes are up for grabs, and the seats are available finished in fabric or SofTex with (thankfully) simplified movement controls. The S-model comes with a three and a half inch TFT panel and across the range carpeting, acoustic glass and dashboard silencer pads make for magnificent insulation and the quietest of rides. 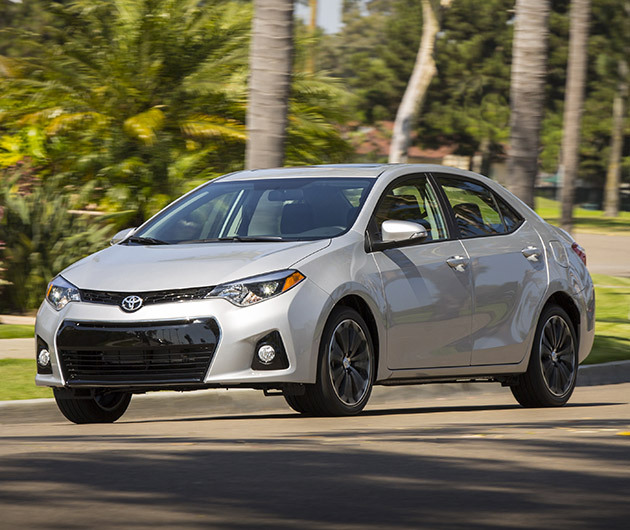 The new Corolla is a car you'll be happy to own, it's athletic with great standards and options. You can pick up the basic model for $16,800, but for the fully loaded S it's a tad north of $22,000. It's definitely the best Corolla yet. We fully expect it to remain one of the biggest-selling cars on the planet.